From washing your hair to throwing darts to grilling a steak, this book has a short how-to section for just about everything you might want to do. It's pretty impressive, really. The author's don't assume any gender stereotypes; they assume their female reader might need to do a very wide range of things, including asking a guy out, changing a tire, and playing many different sports as well as the usual topics like talking to a guy or wearing a scarf. The explanations are split into numbered steps which make things pretty straightforward and are always encouraging. 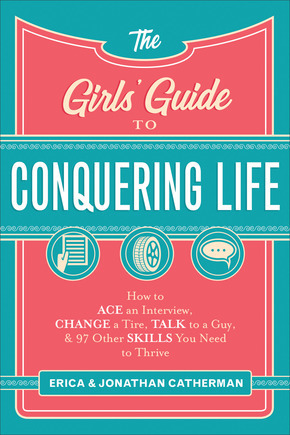 The book is clearly meant for a girl a few years younger than me, perhaps in middle school or high school: there are mentions of asking parents for permission and going through the transition of growing up. The advice is still good, though, and I appreciated reading through it. My only complaint with the format of the book is that there weren't enough illustrations to go with the instructions: some of the entries were a bit confusing without images to show what the authors meant. I also thought there were some topics that should have been included. If the book is meant for younger girls, a discussion of tips for dealing with their period would have probably been very helpful. As would a section of advice for asking parents for more freedoms, or some tips for picking a college or moving away from home/finding a community in a new place. I suppose no one book could have every single thing, though, and this book does cover quite a bit. It's a bit strange that it's marketed so strongly to girls, since the same advice holds true for guys in almost every single section, but I would probably recommend it to both genders. A lot of its advice is pretty familiar to me, but it would be perfect for people who don't have parents to teach them these sorts of things.